Although drink driving is widely accepted to be the most dangerous action on the roads, recent evidence suggests that mobile phones present an even greater risk. Whether simply using a mobile phone adversely affects your health has yet to be satisfactorily proven, but what is certain is that your health is at risk if you do so whilst driving. Operating a mobile phone whilst at the wheel is widely believed to impair driving performance and increase the risk of accidents. Recent research has concluded that you are four times more likely to be involved in an accident if you use a mobile phone whilst driving, and therefore pose a greater danger to pedestrians and other drivers than drunk drivers. 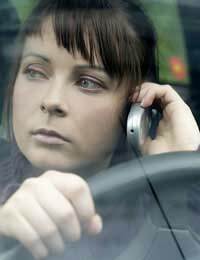 Studies at the University of Utah in the USA found that drivers talking into a mobile phone were 9% slower at putting on the brakes, 24% more variable in the distance they maintained behind the car in front, and 19% slower in resuming their regular speed. Such impairments are similar to those of drivers just over the drink-driving limit. Although they present a similar danger to other road-users, mobile phone-using drivers have yet to be singled out as being as reckless and dangerous as drunken drivers. Updates in the laws over the last few years have attempted to redress this imbalance. Regulations banning the use of a hand-held phone, or similar device, were first introduced in December 2003. After deciding that a further deterrent was needed, new legislation in February 2007 increased the penalties from £30 to £60, or up to £1,000 if the case is taken to court - £2,500 for drivers of buses, coaches or goods vehicles. In addition to the fine, failure to comply with the legislation will result in three penalty points being added to your licence. The law also apply to texting while driving, which is considered a similarly hazardous act, if not more so. According to the Transport Research Laboratory (TRL), steering control while driving is drastically reduced if the driver is texting at the same time, with the standard level being reduced by an alarming 91%. This makes them considerably more dangerous than drivers who have smoked cannabis, whose reaction times are only lowered by 35%. New ‘definite’ guidelines, introduced by the Sentencing Guidelines Council (SGC) in July 2008, now defines reading or composing text message ‘over a period of time’ while driving as a ‘gross’ avoidable distraction. If such an action results in the death of another citizen then the driver is guilty of death by dangerous driving, and could find themselves faced with a prison sentence of up to seven years. Are Hands-Free Mobiles a Solution? Using hands-free phone equipment may seem like a safe and legal alternative for those drivers still intent on making calls while at the wheel. However, although still legal, it is not considered wholly safe as it still causes a distraction and therefore a risk. If police see a driver not in proper control of a vehicle whilst using hands-free equipment then they are liable for prosecution.